Compassionate, personalized care and medical excellence are chief hallmarks of the department of neurosurgery. 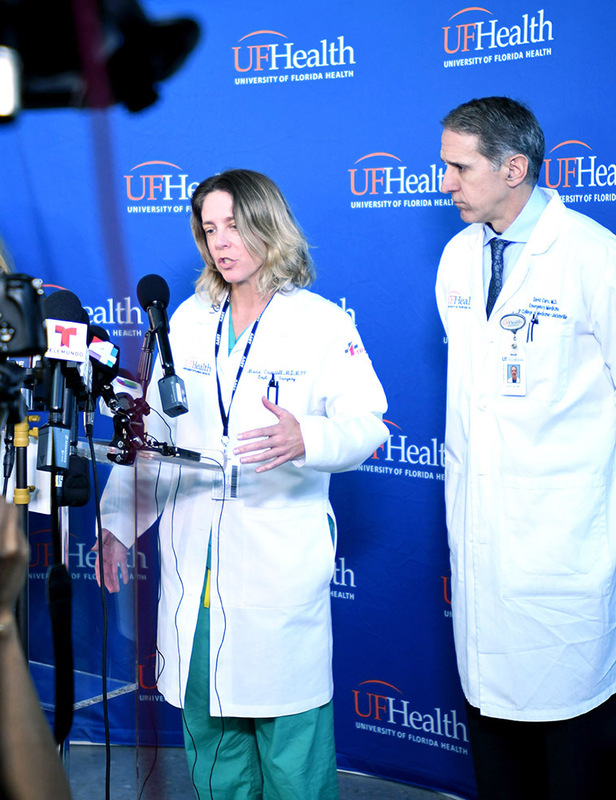 Compassionate, personalized care and medical excellence are chief hallmarks of the department of neurosurgery at the University of Florida College of Medicine – Jacksonville. The department consists of nine highly trained faculty neurosurgeons, 12 advanced practice providers and other amazing support staff who put patients’ needs first. We have positioned ourselves as the region’s premier neurosurgical provider, caring for patients throughout Northeast Florida, Southeast Georgia and beyond. We treat a wide array of diseases and conditions affecting the brain and spine. Tumors, aneurysms, degenerative disc diseases and movement disorders are some of them. "We have positioned ourselves as the region’s premier neurosurgical provider, caring for patients throughout Northeast Florida, Southeast Georgia and beyond." This year, we held a grand opening celebration for the Comprehensive Spine Center, located at UF Health North. We provide state-of-the-art care for the treatment of all types of spine disorders, from chronic back pain to complex conditions such as adult scoliosis. Other conditions treated include intervertebral disc disease, spinal tumors and spine deformities. Our team of specialists meets weekly to review patient cases and develop individualized treatment plans. Strong camaraderie among faculty and staff is strong, as we regularly rely on each other for perspective and expertise. Kourosh Tavanaiepour, D.O., an assistant professor of neurosurgery, directs the spine center, which is the only one of its kind in Northeast Florida and Southeast Georgia. 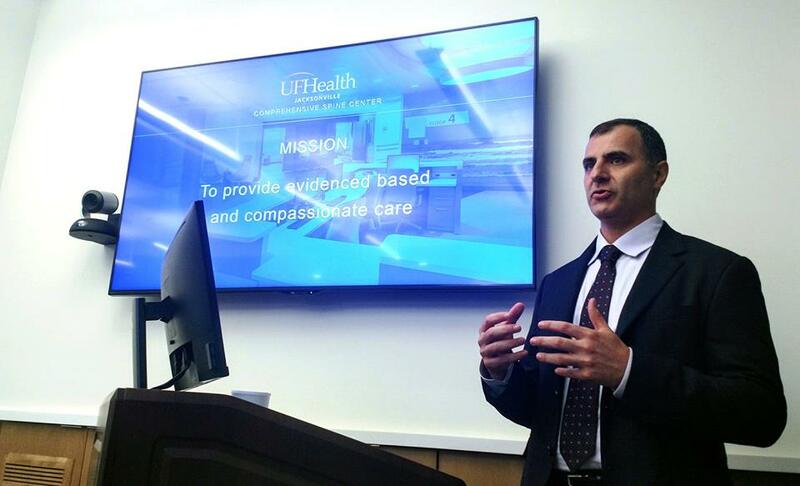 Daryoush Tavanaiepour, M.D., an assistant professor and interim chair of neurosurgery at UF COMJ, presents during the grand opening celebration of the UF Health Comprehensive Spine Center – North. 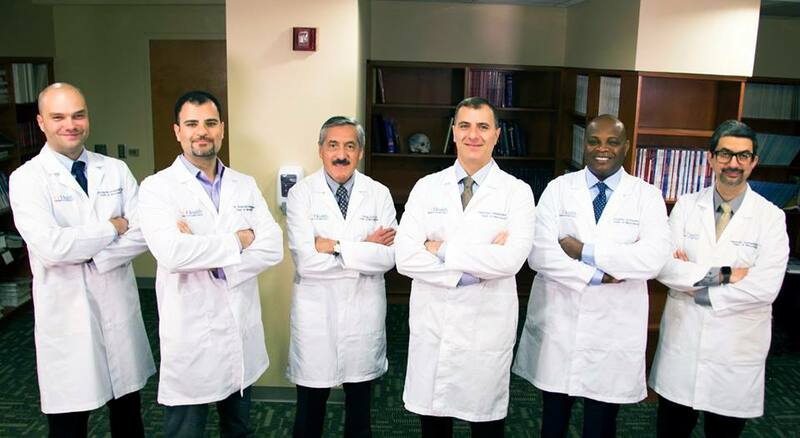 The spine center’s team of board-certified, fellowship-trained neurosurgeons includes, from left, Grzegorz Brzezicki, M.D., Ph.D.; Kourosh Tavanaiepour, D.O. ; Carlos Arce, M.D. ; Daryoush Tavanaiepour, M.D. ; Dunbar Alcindor, M.D. ; and Gazanfar Rahmathulla, M.D. Meanwhile, the Skull Base Center, located at UF Health Jacksonville, continues to welcome patients who seek treatment for brain tumors and related conditions. The center is led by Daryoush Tavanaiepour, M.D., and co-directed by Rui Fernandes, M.D., D.M.D., an associate professor and associate chair of oral and maxillofacial surgery. We are equipped to handle complex skull base pathologies and use the latest advancements in technology and treatment — some of which are the result of our own research and clinical trials. This is the only such center between Atlanta and Miami. We teach medical students and train resident physicians who rotate through our department as part of other UF COMJ residency programs. Those include neurology, oral and maxillofacial surgery and orthopaedic surgery and rehabilitation. We also train neurosurgery residents from Mayo Clinic Jacksonville via a partnership with that hospital. We take pride in helping prepare the providers of tomorrow for practice. 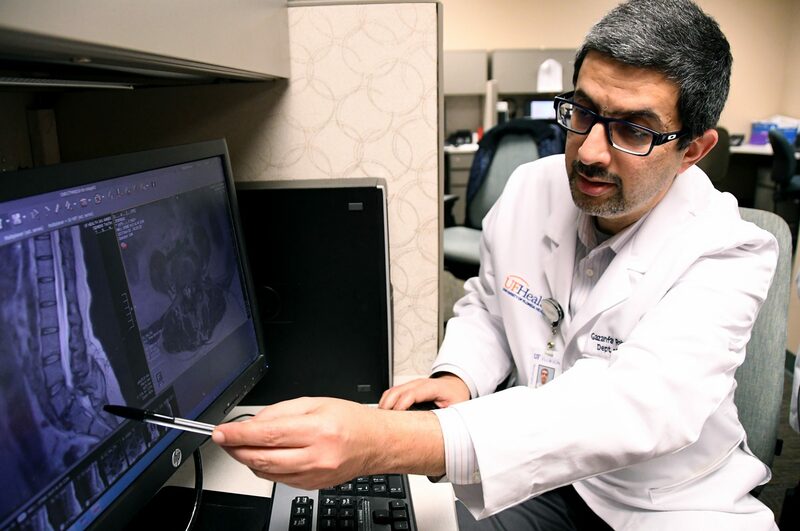 Gazanfar Rahmathulla, M.D., an assistant professor of neurosurgery at UF COMJ, illustrates sections of the spine. The educational offerings are another example of the strong multidisciplinary approach that exists across departments. As our faculty members teach future surgeons, our entire department remains committed to expanding services and reach while continuing to provide exceptional, high-quality care that is second to none. 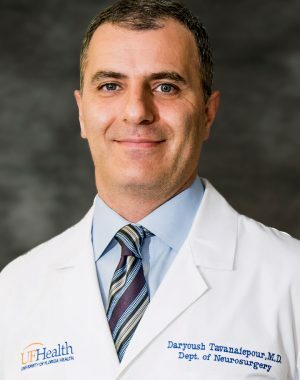 Daryoush Tavanaiepour, M.D., is an assistant professor and interim chair of neurosurgery at the University of Florida College of Medicine – Jacksonville. The college welcomes its new senior associate dean for research.